October 27: Theme Groups Meeting 1: What a Night! The opening theme group meeting was a truly exciting event as people convened at Ephesus Elementary School from 4:30 – 6:30 PM on October 27. Elements from earlier in the process made a reappearance: in each classroom where a theme group was meeting, word clouds and theme summaries, which have been displayed since they were voted upon since the October 6 meeting, but they were also accompanied by citizen comments which have come in since that meeting (see comments on the blog, point of view stories). The facilitators really had their work cut out for them as they had two hours to work through introductions, clarifying thematic areas, and developing a list of resources to help in the decision-making process. The theme summaries and word clouds helped to provide a point of reference for some groups as they worked to develop mutual understanding of what terms meant. Town staff members were on hand to help residents develop their list of resources. Recorders were also on hand to take notes for each group to capture sentiments, compile a list of needed resources, and prepare for the November 19 meeting where the groups will report out. The groups ranged in size from about 10 more than 30. At the end of the evening facilitators asked participants to look around the room, note whose voice was missing, and recruit them for the next meeting, a reporting out designed to gather some common elements from the theme group meetings. The next meeting is November 19 from 10:30 AM – 12:30 PM at Chapel Hill High School. 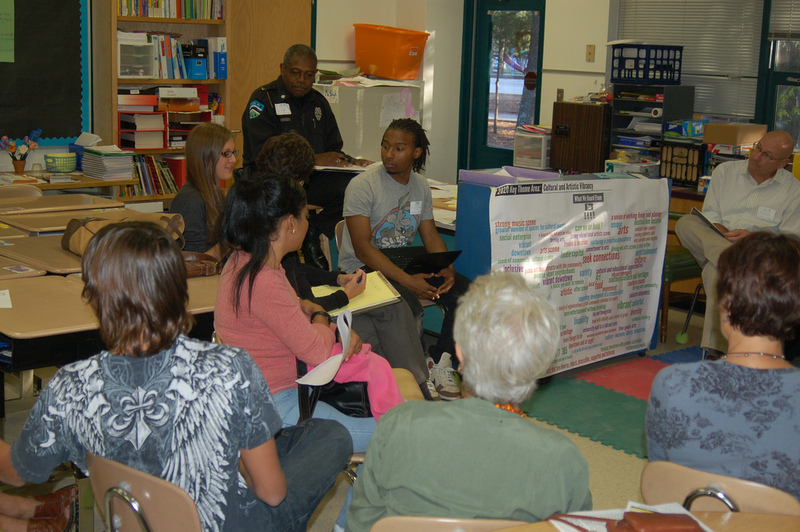 After that conversation between the theme groups, they will meet again individually on December 1 from 4:30 – 6:30 at Frank Porter Graham Elementary School. Reports from each theme will be posted here, on 2020buzz, shortly. Even if you weren’t there on Thursday, It’s not too late to get involved and have your voice heard! Come to a meeting, participate here, or ask our Outreach Committee to come to you. Next PostWhat Do You Predict for 2020? We should compliment the planners involved in organizing. This process is a model for good governance. I am looking forward to seeing a place to post theme-specific concerns and topics.